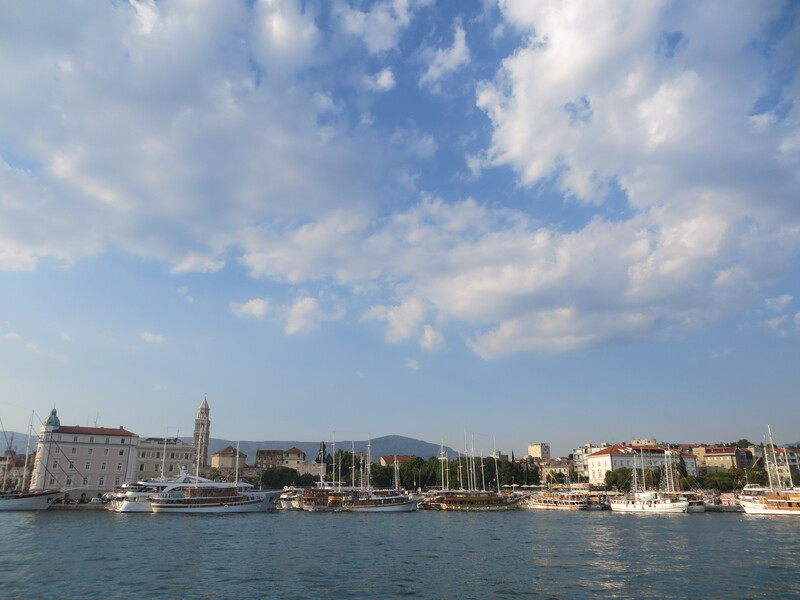 Ninety minutes by plane from the Swiss Alps lies the enchanting city of Split. Established in the 4th century B.C., Split gained prominence as a trading port after the construction of Roman Emporer Diocletian’s Palace in 305 A.D. But that prominence came at a price as many civilizations fought and gained control of the city over the next 1,700 years. Today, the second largest city in Croatia remains a bustling cultural center where the ancient and modern mingle. 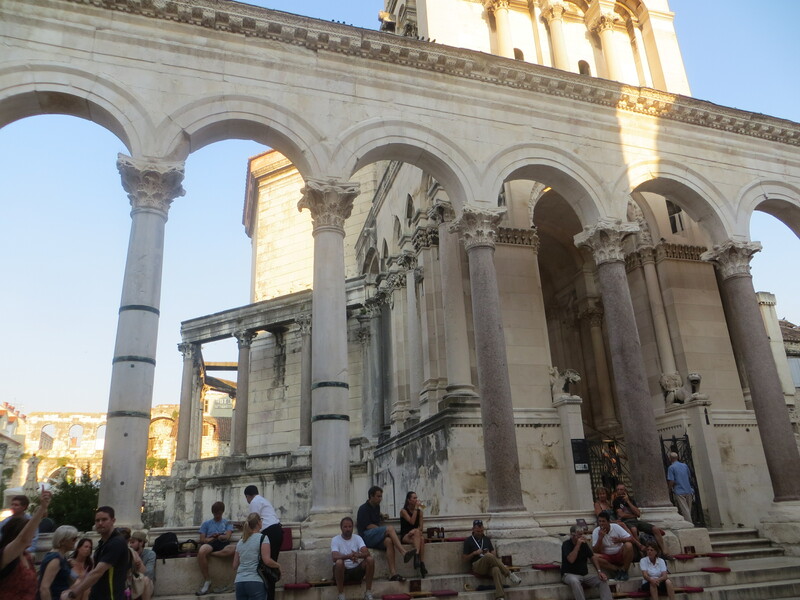 Twelve hours in Split was not enough, but we tried to get the most out of it. 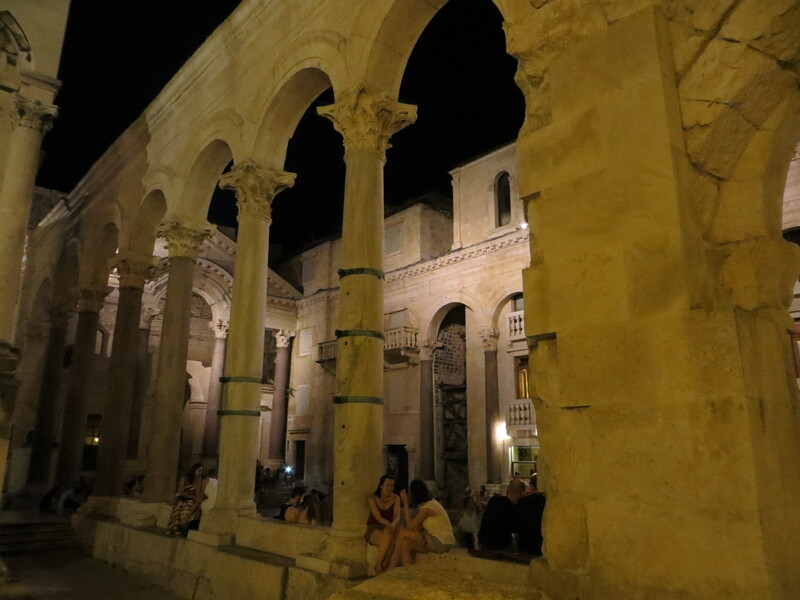 The photos above are of my favorite spot in the city–a part of Diocletian’s palace that has been converted into an outdoor bar. In the evening, local musicians turn the courtyard into a free, live concert. Sitting under the ancient Corinthian columns while drinking Croatian wine has to be the best way to take in the largess of the place. “Old” doesn’t even begin to describe this city. The physical beauty of Croatia barely beats out its cuisine as my favorite thing about this country. Every meal was incredible. Mediterranean at its base, Croatian food draws on what is available in its own backyard: olives, capers, sheep’s milk cheeses, hams, walnuts and figs. 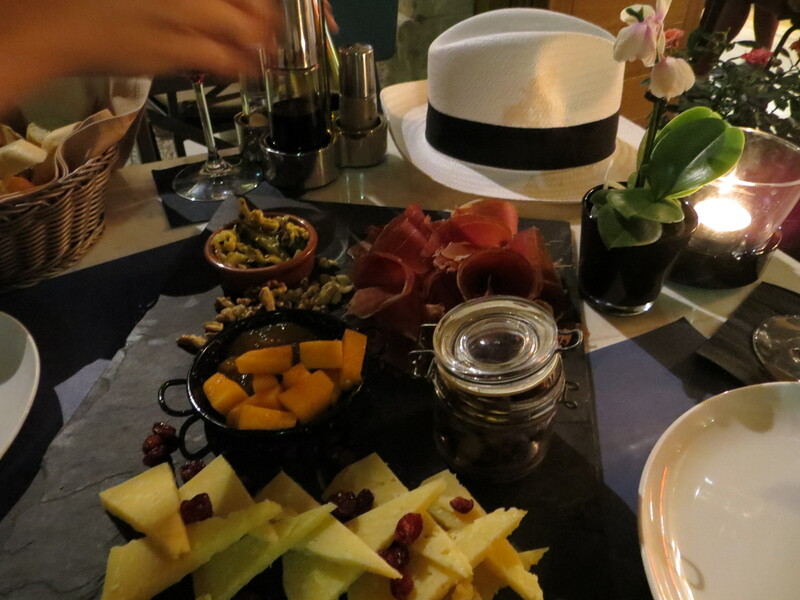 While on Hvar we ate almost exclusively seafood, in Split we ate almost exclusively cheese platters! 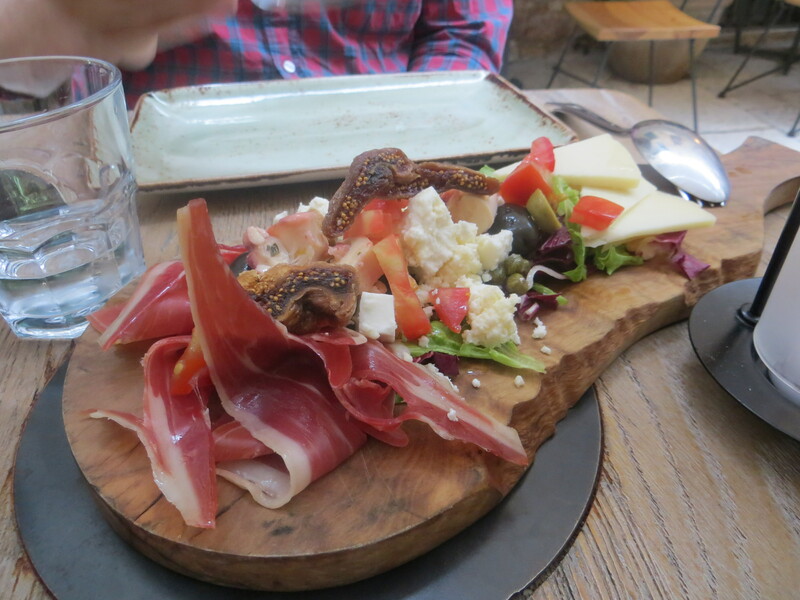 We have our fair share of meat/cheese dishes in Switzerland, but Croatia’s take was entirely new. We savored pickled mushrooms and apricot chutney, lavender honeys and newly pressed olive oils. And the wine. Oh the wine. We seriously contemplated paying the hefty checked baggage fee, just so we could fill our carry-on with bottles. I’m no wine expert, so I’ll simply leave it at that. This is Carrie Ann Sill. Sue Benham just shared your blog with me today. I love what you shared about Croatia. Amazingly I had grandparents that immigrated from Hvar sometime between 1917 and 1922. In 2005 I visited relatives in Hvar. The apartment where we stayed was near the top of the mountain. My bedroom window overlooked the harbor. Everyday I would take in the gorgeous view of the harbor and think that my grandparents left this for Delano!!!!! What were they possible thinking? Maybe someday I will have the wisdom to understand. What an amazing story! I love this. We did not see much of Croatia, but Hvar is still maybe my favorite place I’ve been to in all of Europe. So breathtaking! I can’t sing its praises enough. My great grandfather left Switzerland for California and sometimes I can’t believe it either. I suppose the grass always seems greener…hence, how I ended up over here! I like your comment: The grass is always greener on the other side of the fence. But honestly my grandparents left after WW1 and before WW2. They were looking for a better life and through hard work and dedication they achieved it for their whole family. I recall only once as a child my grandmother in a moment of haste saying, “We ran from Communism.” That was all that was said. No details, no complaining, no explaining. They were amazing people. They came to America with hope and their Faith in God and nothing more. I think daily about my grandparents and how they never lost their Faith in God, the love they showed for their family and their strong work ethic. Today I am the person I am because of them. I traveled as a college student in Croatia in 1979 and had a chance to return in 2005. There was a HUGE difference in my observation between the two trips. Tito was no longer and the political climate had changed in 2005 due to much suffering of the people in the 1990″s. Today the country is happy and able to express their happiness and hopefulness; hence, the reason travelers are able to come and enjoy what Croatia has to offer. Have a good day. I look forward to more of your ventures. I am off the Santa Monica to spend the day at the beach with my niece, Sarane, before she leaves for Cornell. This is her first year in college and I want to spend the day with her before she travels off to Cornell and I won’t see her until Christmas.